In the matter of Franchetti v. Ranieli, No. 7461 of 2010 (CP Luz. Co. 2012 Burke, P.J. ), President Judge Thomas F. Burke, Jr., granted a Plaintiff's Motion for Protective Order and limited a vocational expert’s examination to four (4) hours. President Judge Burke further compelled that the examination would be conducted Interrogatories in a local venue and not in the vocational expert’s office in Valley Forge, PA. In an Order entered by the Honorable Michael T. Vough in the matter of Price v. Price, Auto Glass Unlimited and State Farm Mutual Automobile Insurance Company, No. 13625 of 2010 (C.P. Luz. Co. 2012 Vough, J. ), Judge Vough directed that a vocational expert appear to testify and explain before the Court on the issue of the location and requested length of his desired interview of the Plaintiff. Reportedly, in response, the vocational expert agreed to be guided by the restriction set by President Judge Burke in Franchetti and the November 19, 2012 hearing on the Motion in the Price case was cancelled. In neighboring Lackawanna County, in the case of Marion v. Motorist Mutual Insurance Company, No. 11-CV-7451 (C.P. Lacka. Co. 2012 Burke, D.M. 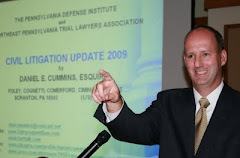 ), Attorney Henry Burke, in his capacity as the Lackawanna County Discovery Master, essentially adopted President Judge Thomas Burke’s position from the Franchetti case. Judge Henry Burke restricted a vocational expert's examination to five (5) hours, ordered that it take place at a local venue, and that a representative of Plaintiff’s attorney’s office be allowed to be present (consistent with Rule 4010 and Rule 4010.1). I send thanks to Attorney Neil O'Donnell of the O'Donnell Law Offices in Kingston, PA for bringing these decisions to my attention.